What is the truth about alternative facts? Many are rightly annoyed at the President’s temporary travel ban that they protest is a racist ban on Muslims, despite Trump saying that it is a temporary ban from Countries who have lax checks on security to protect American people from possible a terrorist attack. In much the same way as there was an expression of incredulity of how could people have voted for Brexit, despite the facts and advice from the experts, there is great concern of how the people of America could possibly have voted for Trump against the Democrats / Hilary Clinton with their celebrity endorsements and media advocates. There is much to dislike about Trump from his disregard for women’s choice in parenthood, his disdain for free speech, movement and democracy to his disregard for political process where he acts more like a Chief Executive Officer (CEO) than a representative of the people. However, to have voted for Hilary would have been a vote for a continuation of the politics of the last 25 years whereas Trump promised something different. Throughout the American election campaign, Hilary Clinton told her opponents to check the facts and insisted that data existed to support her policies. This may have helped her score some points during the campaign and she used her experience in office to expose Trump’s lack of preparation and political inexperience. Trump actually used his lack of experience in political office to his advantage in that he openly stated that was not a career politician and just wanted to get things done. This worked well as many people are sceptical of politicians and have experienced the Obama years that promised change with ‘the audacity of hope’ but haven’t delivered the improvements in living standards or job security expected. Trump’s campaign manifesto included defending American jobs, building infrastructure, cutting red tape and getting things done to make America great again. This meant a commitment to growth and development, overriding the restraint on growth and development required to keep agreements made with regard to Kyoto and Paris agreements to cut greenhouse gas emissions by previous administrations. Trump made no secret of his sceptiscm of the climate change lobby and his dislike of a politically correct etiquette. He didn’t like being told what to think, feel and behave and this had resonance with many American people feeling disenfranchised. There are parallels with the Brexit issue in the UK where Michael Gove said in the run up to the referendum that ‘people had had enough of experts.’ The Vote Remain campaigners believed that the facts were on their side and a lot of effort was made to convince the electorate by the great and good, business and academic institutions, banks and celebrities to back the Remain in the EU vote, and that the politicians and parties supporting the Leave campaign were xenophobic. When the unexpected result came in they could only conclude that people had taken leave of their senses and voted instinctively. They suggested that the voters did not have the right information and were mislead. It was a complete rejection of being told what to vote, what to think and how to behave. I suggest that it is not experts or expertise that people have given up on. It is not that people have become unhinged and irrational. It is rather the rejection of the experts selected by elitist politicians and celebrities. In all fields there are experts who will disagree with the findings and conclusions arrived at based on the same evidence. It is not that we have given up on the pursuit of truth by means of reason and rationality. As politics of principle have diminished with the development of managerial and technocratic systems there has been a greater emphasis on evidence based policy which tends to say ‘the evidence says this ...’ in order to support a particular policy, with the intension of closing down further discussion and avoiding the contest of a particular viewpoint. This is often presented as ‘this is how it is’ and the way that closes down discussion or the need to contest a particular viewpoint. It is the lack of debate and contestation of how facts are interpreted that is problematic. Facts are based on empirical data but the conclusion can be debated according to how the data is interpreted. Politics, whilst not oblivious to facts is about principles and aspirations and is open to argument and debate. Democracy means that one man gets one vote whether you are a CEO or shop floor factory worker. This principle should be vigorously defended. 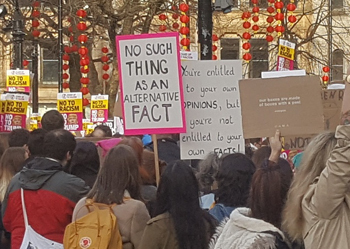 The idea that people have given up on true facts for alternative facts is disingenuous and contemptuous of the electorate and democracy. Democracy is threatened when the right to vote is questioned because some people vote the wrong way. The problem with the viewpoint that people have given up on facts is that the accuser has given up the potential to engage with those they disagree with. There is no possibility of constructive dialogue which can help bridge the great divides in society to bring about the changes that are so desperately required. The election of Trump does open up the possibility of raising questions about the direction of politics and what do people aspire to. There needs to be more questioning of everything and more robust debate amongst people of all viewpoints, especially those you disagree with.